Croatia remains competitive as an expat destination, boasting of prices that are 30% to 40% cheaper than most of Europe. 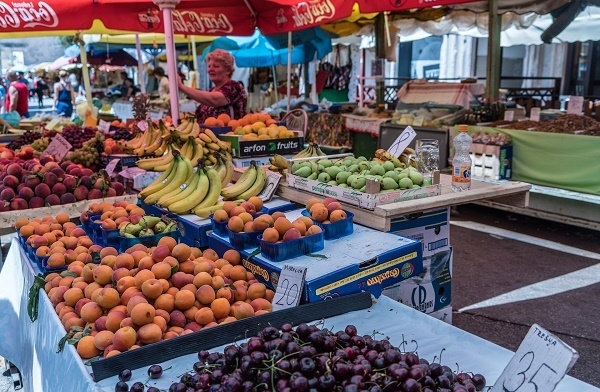 In Croatia, a family would spend an average of 1166 US Dollars or around 5000 Kuna monthly on food, including groceries and non-alcoholic beverages. Basic food products like milk costs about 8.80 Kuna per 1.5 liters, butter is priced 7.99 Kuna for 255 grams while a kilo of sugar is at around 8 Kuna. Meat and poultry also come at affordable prices, with pork cutlets averaging about 44.48 Kuna per kilo and a whole chicken costs about 25 Kuna per kilo. Local produce like fruits and vegetables are cheaper while imported groceries are almost the same price as they are in the UK or US. As with any situation, how much you spend on food depends on what you eat and where you eat. An expat who prefers to stay at home and cook would spend an average of about 150 Kuna per day. Eating out is also cheaper in Croatia. A good meal with the main course, wine, and coffee would only cost about 100 Kuna per person (that's equivalent to about 19.95 US Dollars). A liter of good house wine is priced at around 60 Kuna 1. Daily menu in business district costs 44 kn while a dinner out for two in an Italian restaurant with wine and dessert306 kn. For fast food, 1 Big Mac Meal costs 30 - 35 kn. As an expat who's just settling into a foreign land, finding just the right place for the right price is essential. If you are a single expat and more into convenience than comfort, renting a house or an apartment would be a good option. The rental options can be quite limited, most of them are found in the key cities of Zagreb, Split, and Dubrovnik. If you're looking into shared space, renting a room in a shared apartment in a good location costs about 1200 Kuna (about 235 US Dollars) per month. Families who are not yet ready to buy property in Croatia may also opt to rent. Monthly lease on a furnished two bedroom apartment in a convenient area would be about 2100 Kuna (about 412 US Dollars), while renting a furnished two bedroom house in the same area would cost about 5000 Kuna (about 981.55 US Dollars). Purchasing property in Croatia also requires obtaining consent from the Minister of Foreign Affairs. The process takes about six months to one year. And real estate prices do not come cheap; a house in Zagreb costs about 8593 Kuna per square meter (equivalent to 1718.90 US Dollars). Maintaining household utilities is also inexpensive. The cost of electricity on a monthly basis is about 150 Kuna while water usage averages about a 100 Kuna. Household expenses include garbage collection and sewage, which costs around 150 Kuna per month. Communication costs for a monthly internet connection is around 115 - 190 kn. Petrol is priced at around 9 - 11 kn per liter for 1 liter (1/4 gallon) of gas. On average, one would spend about 601.35 Kuna per month on clothing and footwear. If jeans are your wardrobe staple, a good quality pair of denim in Croatia costs about 300 Kuna (58.89 US Dollars). For those who go to a formal workplace, a man's suit cost about 1500 Kuna (294.46 US Dollars) while a woman's is slightly cheaper at 1300.00 Kuna. Men and women's footwear are somewhere around 550 to 700 Kuna a pair (100 to 150 US Dollars). Recreation/entertainment costs on a monthly basis figures around 2070 Kuna (around 400 US Dollars). One can enjoy a pint of beer in a bar, which is about 15 Kuna, roughly around three US Dollars. Families may also check out the latest concerts and plays. Concert and theatre tickets are also affordable, ranging from 60 to 200 Kuna (12 to 40 US Dollars). 2 tickets to the movies costs 67 kn while 2 tickets to the theater cost 149 kn. For expats on the lookout for a better life and a better cost of living, you don't need to look any further.